An exceptionally high tide was experienced in the United Kingdom at noon on November 26. The Essex coast was on flood alert last night after a freak tide engulfed a popular waterfront, completely swamping a number of cars. 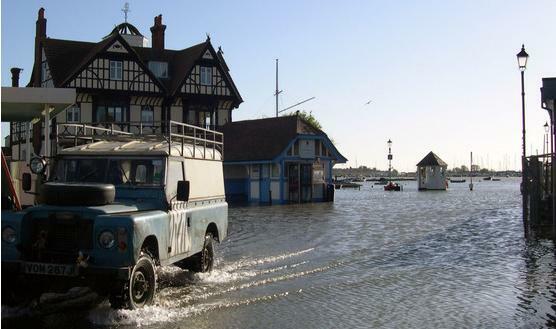 The surge happened at Brightlingsea at around noon when a spring tide led to the sea rising over the town's hard and as far up as the Waterside fish and chip restaurant. In Suffolk and Norfolk the tide breached sea walls and coastguards were warning last night that a further tidal surge was expected at about midnight. Could this be related to the Earth wobble? The wobble was featured just last week in this newsletter, Issue 51. ZetaTalk Explanation 12/1/2007: It was the east coast of Britain that experienced the high tide, this tide coming from the North Sea. What happens when the Earth wobble, the figure 8 so well documented on the ZetaTalk website, affects Britain? When the noon Sun is over India, the Earth has assumed a more normal stance vis-�-vis Planet X. 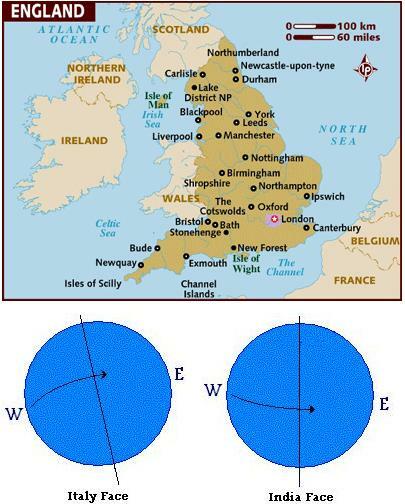 But then the noon Sun is positioned over Europe and Britain, the N Pole of Earth is pushed up, suddenly, with a tilt in the direction of the Americas. This lurch forced Britain into the North Sea, increasing the press of water coming from the North Sea. Britain in essence was pushed into the oncoming tide! 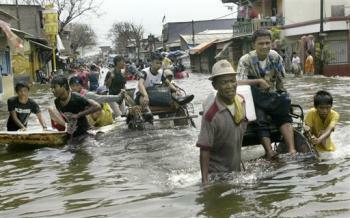 On November 27 Indonesia and Vietnam also experienced an exceptionally high tide. These high tides might seem to be a day apart as noon in the UK places the date a day later in Indonesia, which is just past the International Date Line in the Pacific. However, these high tides occurred at the same time, on nearly opposite sides of the globe. High tides in Indonesian capital forced thousands of people to abandon their flooded homes and cut off the road leading to international airport. Authorities installed pumps to bring down water levels, which were 1.7-meters (yards) high in several subdistricts and reached up to two kilometers (more than a mile) inland, but said they expected tides to continue to wreak havoc through the end of the month. Residents in north Jakarta have grown used to flooding during the monthly high-tide cycle, but Monday's was the worst in memory. Many houses in Thu Duc District's Hiep Binh Phuoc ward are now under one metre of water, with house-hold appliances damaged and dozens of families having to move to safer areas along National Highway 13. Equipment kept outdoors by various companies was also damaged by the water. High tides on the rivers of Tuy An Song Cau in the south central province of Phu Yen caused 50 houses to collapse and sank 11 fishing vessels. What could cause a high tide on opposite sides of the globe, simultaneously? ZetaTalk Explanation 12/1/2007: What happens to southeast Asia, on the other side of the world, when the Sun is at high noon over Britain? 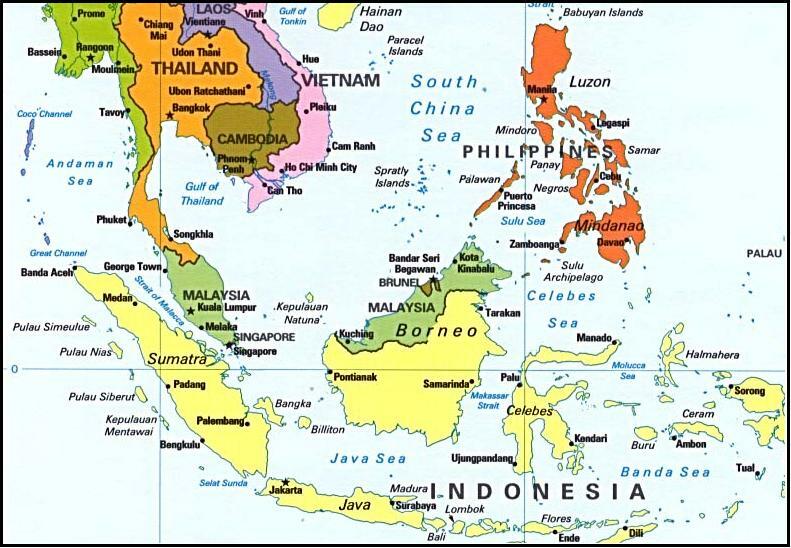 When the N Pole of Earth is pushed suddenly up, toward the north and with a tilt toward the Americas, Vietnam is likewise pushed up and tilted into the South China Sea, and Indonesia is likewise pushed up and sideways into the Flores Sea, the Banda Sea, and the waters trapped between Borneo and Jakarta. Why did such flooding during the high tide not affect the east coasts of Japan or the Philippines or the Americas? These coastlines are open to vast waters, which can absorb the increase in pressure. The North Sea off coast from Britain, the South China Sea off coast from Vietnam, and the seas off coast from the north coast of Indonesia are bounded by land masses and thus pressure can build up when the land is shifted under these waters. We have warned of a time when high tides would be experienced, unrelated to tsunami from earthquakes and unrelated to storms. We warned likewise that the wobble would produce such high tides. This time is now upon the Earth. And indeed such warnings were given by the Zetas, who predicted these times as far back as 1999. At first these warnings excluded the wobble, as the Zetas intended the wobble to take the establishment by surprise. But after 2004 when the wobble had emerged, they admitted this was the reason for the high tides they had been warning about. ZetaTalk Prediction 4/15/1999: Tides that are greater than expected, especially along the Pacific coastlines. ZetaTalk Prediction 1/12/2000: We also predict, as we did last year, that there will be high tides. Not tsunamis, following earthquakes, but unusual high tides. ZetaTalk Prediction 8/26/2006: We have predicted that coastlines will become uninhabitable, in many places, so that crops are grown but man sleeps restless there. The degree of assault on coastlines that will occur as the Earth wobble increases is hardly imagined. Days after the high tides in the UK and Indonesia, the stress on the St. Lawrence Seaway caused a major oil pipeline from Canada to the US Midwest to pull apart, resulting in a fatal fire. This pipeline breach might not have hit the news were it not for its effect on the price of oil, which appeared to be the big news. A deadly fire at a pipeline from Canada that feeds oil to the United States sent oil prices soaring. Two workers fixing the underground pipeline were killed when fumes apparently escaped and ignited the blaze. No other injuries were reported. The fire along the Enbridge Energy pipeline in northern Minnesota was reported shortly before 4 pm [Wednesday, November 28]. The 34-inch pipeline carries crude oil from Saskatchewan to the Chicago area. The pipe had leaked a few weeks ago and was being repaired. It appears as though one of those fittings may have failed and caused fumes to leak, and it caught fire. 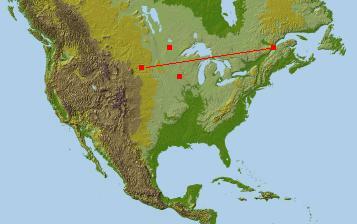 Clearbrook is about 215 miles northwest of Minneapolis. Per the news, the pipeline had leaked weeks ago, been repaired, and burst again. What is causing the leaks, and why would a freshly repaired pipeline be so weak as to burst again? Clearly, this part of the seaway stretch zone is pulling apart. The Minneapolis bridge collapse was the result of such tension along the seaway stretch zone. The land to the east of the Minneapolis highlands pulled to the east, creating a torsion stress on the bridge, a matter recorded on video by security cameras focused on the bridge during the moment of collapse. Per the Zetas, the seaway stretch zone ends at the Black Hills of South Dakota, which explains why they are so rumpled and tossed. Put a line from the mouth of the seaway to the Black Hills and where does that line pass through? Minneapolis and Clearbrook! The Zetas have long warned of this St. Lawrence Seaway rip, including it as part of the scripted drama that will occur during the hour of the pole shift. ZetaTalk Prediction 2/10/2006: The stress on the N American plate will resolve by ripping the St. Lawrence Seaway open. A widening Seaway also does not affect just those land masses bordering the Seaway, as buckling occurs inland and afar. What does man assume caused the Black Hills to be so rumpled, with the appearance of a recent buckling and heaving? This is the center of a land plate! The tearing of the Seaway does not end at Duluth, MN. It travels underground to South Dakota! The Zetas also predicted oil and gas line breaks, with resultant fires. Where a fire in crude oil is more easily subdued, we can expect such breaks to occur in natural gas lines too. These will be far more explosive. ZetaTalk Prediction 9/29/2003: Far worse than this are breaks that are about to occur in gas lines and gasoline refinery and distribution networks. When these break, as break they will, there will be explosions and fires that will not be so easily corrected nor subdued. A holocaust, an inferno, one that spreads without abatement along the distribution lines, so hot and intense that none can approach. China likewise has experienced a change in its tides. Both the Yangtze and Yellow Rivers are finding a salt water backwash, a reverse tide. Where this normally happens after the equinox for a period of time, for the Yangtze this is occurring almost two months after the expected timeframe, and for the Yellow River, more than a month late. 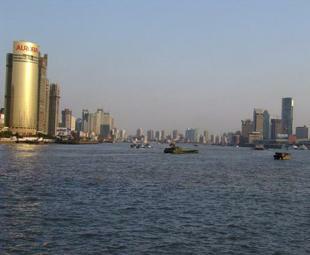 A salt tide hit Shanghai on Wednesday, two months later than usual. Water sample tests at Chenhang Reservoir near the Yangtze River estuary at 11am on November 28 found more than 250 milligrams of chloride in every liter of water, indicating the tide has moved into the mouth of the Yangtze River. Water flow from the Yangtze dropped to 13,000 cubic meters per second on Wednesday. The density of chloride kept rising on Wednesday morning, eventually surpassing 300 milligrams a liter. Question: It is said there was a false tide on November 28 on the Yellow River where it enters the Yellow Sea and the frequency increased during November, the phenomena is such that it happened not in the tidal period when these false tides happen. The flow rate increased from 400 cubic meter per second to 1400 cubic meters per second. Usually this happens in October but this year it happened in November and with the frequency increasing. The experts are quite uncertain as to cause. They only indicated that it may related to the river bed or something astronomical. My question: is this evidence of the wobble? ZetaTalk Explanation 12/1/2007: The normal global position vis-�-vis the Sun is such that after the September equinox China experiences a less direct overhead gravity pull from the Sun, as the Yellow River is tipping away from the Sun. This temporarily adjusts the water pressure in the vast Yellow River and the Yellow Sea, causing what the Chinese call false tides to occur during this equalization period. Even though the Earth is stopped in her orbit at present, benign aliens are tilting and tipping the globe to simulate the seasons so this same effect of less gravity pull on the waters of the Yellow River and Yellow Sea are in effect during their normal season. What happens to these bodies of water during the Earth wobble? When the Sun is centered over New Zealand and the Aleutian Islands, the Earth has no particular skew but the magnetic N Pole is pushed away. When the Earth rotates and the Sun is centered over India, the Earth bounces back into a more normal position as the N Pole is hidden. The Yellow River is affected by this push away and bounce back, such that sloshing occurs.